I have never blogged, and I don't know how to ask some one knowledgable a question. So... I am going to ask this in hopes that it generates a response. 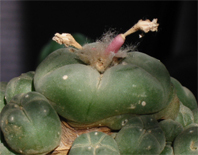 If one has successfully grafted a lophophora, and then subsequently cuts off the main green body from the host, (while leaving the lower part of the Lopho. grafted to the host) will the Lopho. regrow? Or does one have to start over again. In the wild these can be cut off above root level, and will regrow new above-ground bodies. Is this the case with a grafted Lopho; say leaving the bottom 1/3rd of the graft intact? I haven’t tried doing this, but if enough tissue with areoles, i.e. new growing points, is left on the grafted scion it should be capable of regenerating.